Wouldn’t it be awesome to come home from a busy day with dinner already planned and ready to go on the table in just minutes? 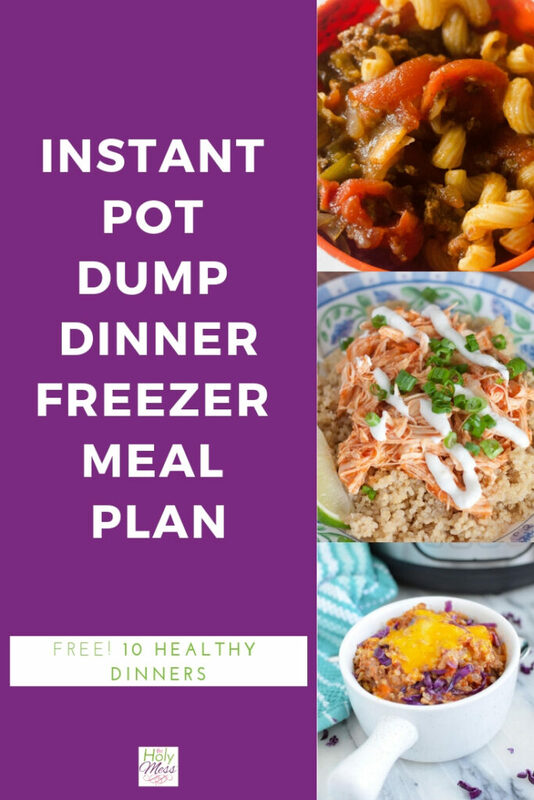 That can be your reality with this Instant Pot Dump Dinners Freezer Cooking Free Menu created especially for The Holy Mess by Once a Month Meals. 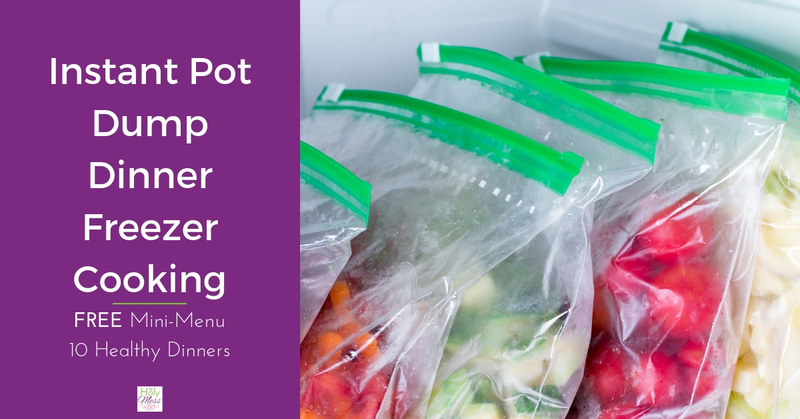 Download a free menu of 10 Instant Pot dump dinners for freezer cooking. Have you heard of Dump Dinners? Dump Dinners are meals where you literally just dump in the ingredients and press start. Dump Dinners were first made popular with crock pot cooking, and when the Instant Pot came on the scene, it didn’t take long for people to realize you could use the same concept and make it even faster with pressure cooking. Since I’ve been writing about Instant Pot Dump Dinners, I’ve learned that my readers love the concept because my posts about dump dinners have skyrocketed. 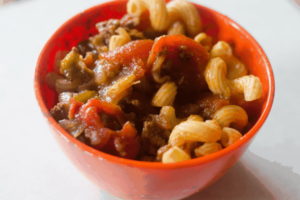 Instant Pot Goulash is included in this menu. Instant Pot Dump Dinners for Freezer cooking makes your life even easier. Instead of dumping everything together the night you cook it, why not make the meals all at once for the upcoming weeks (or month) and stick them in the freezer? 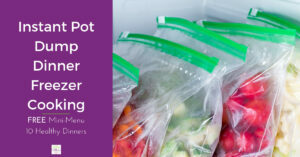 What’s especially handy about Instant Pot freezer cooking is that you can cook the food right from frozen, so there’s no worries if you forget to take something out to thaw. If you’ve been around The Holy Mess any length of time, you’ll know I’m a raving fan of Once a Month Meals. Once a Month Meals is a program that offers everything you need to prep a week’s to a month’s worth of meals at once. Instant Pot Salsa Chicken – healthy and delicious. When Once a Month Meals offered to make a FREE Instant Pot Dump Dinner Freezer Cooking Menu for my readers, you had better believe I jumped on that immediately. Included in this mini-menu are 5 of the most popular recipes from The Holy Mess website completely ready for you to prepare them for your freezer so you can dump and go at dinner time. 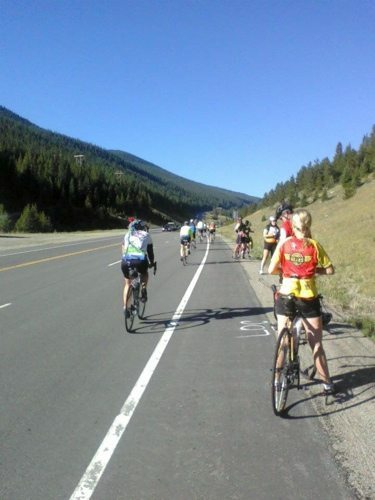 Full disclosure – I’m an affiliate for Once a Month meals, so if you decide to invest in a membership, I receive credit. I have a OAMM membership myself and use it often. Click here to get to the Holy Mess Dump and Go Mini Menu. 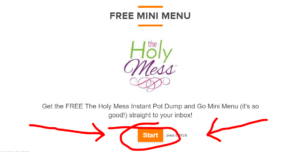 When you click over to download your free freezer cooking menu and instructions, you’ll see this orange button. 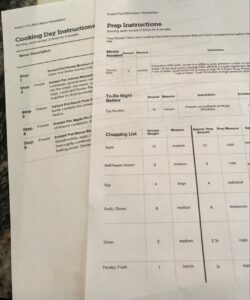 Click to sign up and they’ll send you the full menu and freezer cooking instructions- it’s 15 pages with everything completely laid out for you. 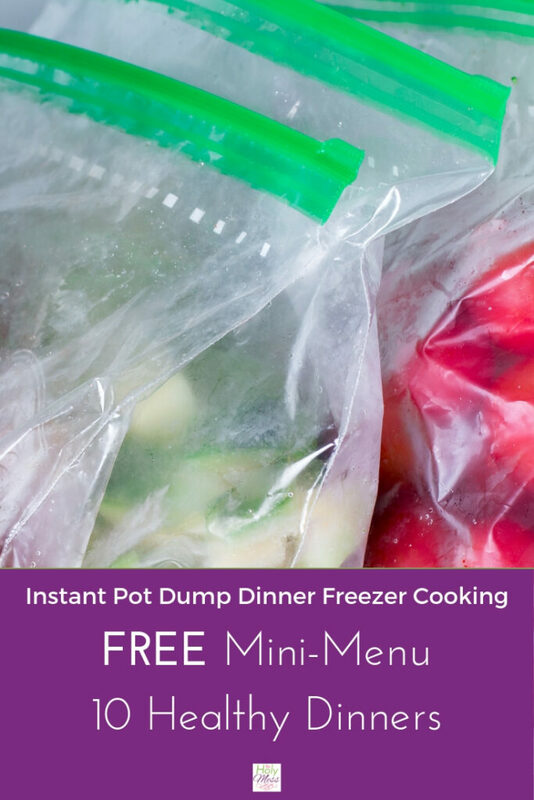 Get your FREE Instant Pot Dump Dinners Freezer Cooking Menu when you click here. You’ll receive instructions to complete 5 recipes and you’ll make 2 of each for a total of 10 meals. You can choose if you want the menu created for 2, 4, or 6 servings, too. Here are the recipes included in the mini-menu. Remember you make 2 of each for a total of 10 meals. As someone who has lost 100 pounds, I understand the importance of delicious meals that are also healthy. Here is the nutritional information for the recipes included in the freezer cooking menu. Once a Month Meals provides all you need. This mini-menu is a taste of what Once a Month Meals is all about, so that you can decide if the program might be right for you. With a Once a Month Meals membership, you can create your own menus, choose from custom-made menus and more . You’ll get everything you need to freezer cook with ease. 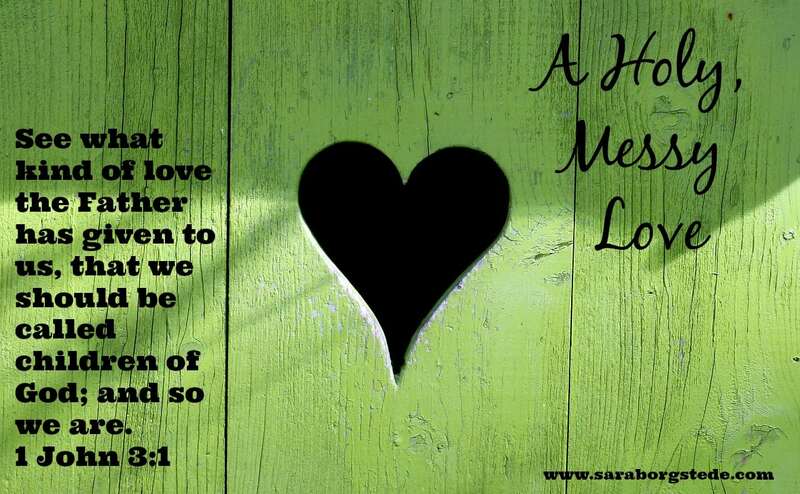 Click here to learn more about what Once a Month Meals is all about. 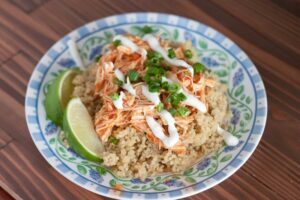 Here are a few helpful tips and hacks when it comes to making these healthy freeze ahead dump meals. These 64 oz round containers are a must when it comes to Instant Pot freezer cooking because the food will be the right size to place into your 6 or 8 quart Instant Pot on cooking day, even if still frozen. Keep in mind these meals do involve some prep work to be ready to dump and go. Typically I consider a dump and go meal as one that you just dump the food in and press start. These meals will be dump and go on cooking day, but you will need to do some chopping and other prep on the day you prepare the food. Give it a try! I encourage you to give freezer cooking a try. Even if you aren’t one to make a whole month’s worth of meals, these mini-menus only take a few hours and it helps so much for busy weeknights. 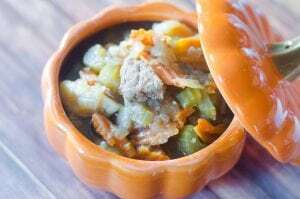 Have you tried dump dinners for your Instant Pot? Click reply and tell me about it. 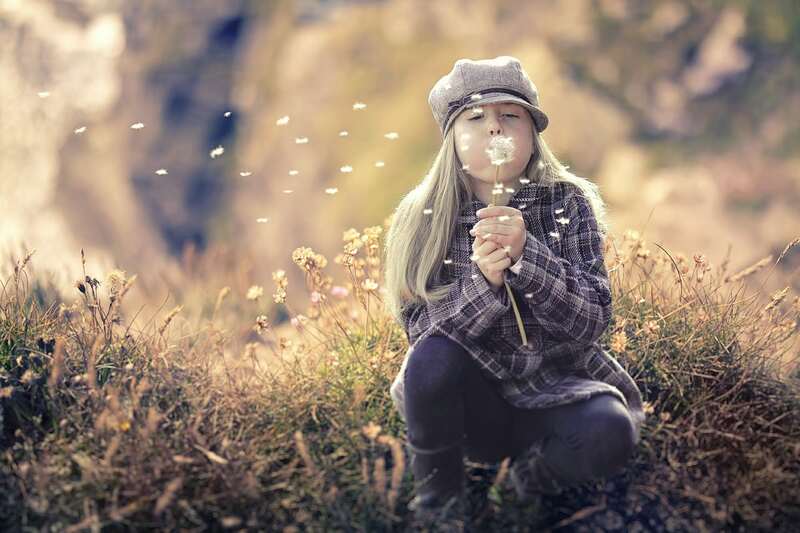 NextWhy Am I Not Losing Weight on Weight Watchers Freestyle?